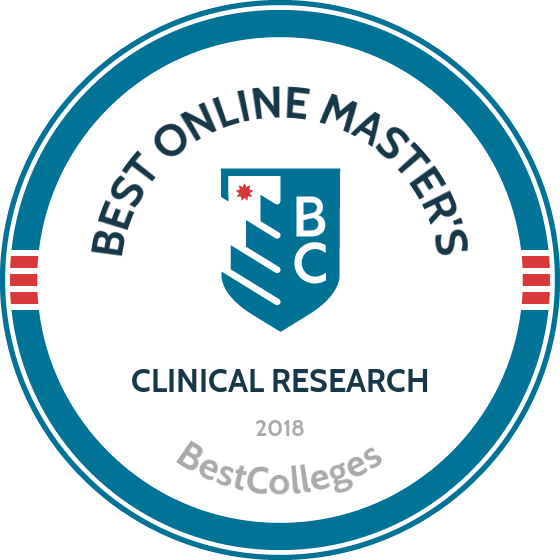 WHAT ARE THE BEST ONLINE MASTER'S IN CLINICAL RESEARCH PROGRAMS? What Else Can I Expect From an Online Master's in Clinical Research Program? Clinical research is a growing career field for students interested in overseeing medical research projects. As the medical industry grows, pharmaceutical and biomedical research are imperative, and graduates who have earned a master's in clinical research online are at the forefront of the research community. The Bureau of Labor statistics projects an 8% increase in demand for medical scientists within the next seven years. Professionals with a clinical research master's online degree earn high salaries due to their extensive education and experience. GWU offers an MS in health sciences in clinical and translational research. Coursework is available fully online, with no on-campus or laboratory requirements for distance learners. This master’s in clinical research online program prepares students to work in clinical and translational research facilities. The 36-credit curriculum comprises 27 core credits and 9 elective credits in biomedical sciences, clinical research and administration, community health research, and health sciences research policy. Transfer students may submit up to six hours of prior classwork for credit. Online classes are taught by the same instructors as on-campus courses, but online students may complete the asynchronous coursework at their convenience. This master’s degree in clinical research online program prepares graduates for careers as CRAs, CRCs, and regulation specialists. OSU’s MS of applied clinical and preclinical research is offered entirely online, with no on-campus requirements. This multidisciplinary program covers the theory and practice of research methodology, statistics, and the ethics of working with human and animal subjects. Students may choose one of four concentrations: clinical research management, regulatory affairs, safety pharmacology, or clinical pharmacology. Most full-time students complete the 36-credit program in one year, and part-time students require two years. Terms begin in fall, spring, and summer. GRE scores are required for applicants whose undergraduate degree is from an unaccredited school or whose undergraduate GPA is below 3.0. UNCW offers a fully online MS in clinical research and product development, which focuses on biopharmaceutical clinical research and device development; this is not a lab-based program. Students earning the master’s of clinical research online from UNCW complete 36 credits, the majority of which are core education classes, though students may take elective courses and pursue specializations. All core classes must be completed within the first three semesters. Full-time students typically complete the degree in three years, and students must complete the MS within five years of initial enrollment and must maintain a 3.0 GPA throughout their studies. This MS degree is offered entirely online, with no on-campus requirements, and distance learners pay the same tuition rate as in-state students. MCPHS offers a fully online MS in clinical research, which has no residency requirements and may be completed on a full-time or part-time basis. This clinical research master’s online program focuses on clinical research topics including bioethics regulations, biostatistics, research methodology, clinical trial regulations, and proposal development. Distance learners should be employed in a related research field; MCPHS believes that, without on-campus interaction, working in the industry is crucial to understanding and retaining skills learned through coursework. Applicants must have a BS or BA from an accredited institution and a minimum GPA of 3.0. Courses begin in fall, spring, and summer, and applications are accepted on a rolling basis. ASU offers an MS in clinical research management that prepares graduates to enter or advance within the healthcare field. The program focuses on the fiscal elements of clinical research, regulatory and ethical aspects of research, and management of clinical drug trials. The online master’s in clinical research program requires 33 credits and a capstone project. Most full-time students complete the MS in clinical research within two years. There are no on-campus requirements for distance learners, but online students may elect to attend a two-day orientation to meet instructors and classmates. All online students pay the same tuition rate, regardless of residency. An online master's in clinical research prepares students to research and develop new products and to manage product data. Each program requires a minimum number of credits, and program details vary based on the school and its master's of clinical research online curriculum. Although course offerings vary by school, all students learning a master's degree in clinical research online learn core skills and knowledge. Below is a sample curriculum comprising common clinical research classes. Introduction to clinical research: This introductory course provides historical context regarding clinical research, with an overview of key breakthroughs and advancements that shaped the modern research world. Students explore research objectives, classifications, and protocols, while strengthening verbal and written communication skills, learning medical terminology, and collaborating with professionals. Biostatistics: Students in clinical research master's online programs learn to decipher statistical information. This course teaches common applications of biostatistics, such as probability, confidence intervals, and statistical inference. Students use specialized computer software to collect and analyze research data. Epidemiology: This course covers the circulation of diseases and other health-related conditions. Students explore previous studies and learn how to improve future projects. Students are prepared to research acute outbreak investigations, randomized trials, and the interpretation of measures. HOW LONG DOES IT TAKE TO GET AN ONLINE MASTER'S IN CLINICAL RESEARCH? The number of required credits and a student's enrollment status affect the completion time for an online master's in clinical research. Each program comprises core courses, electives, and a capstone. Students may enroll full- or part-time, but some schools require students to take at least one to two classes per semester. On average, master's of clinical research online programs require 36 credits. Distance learners may choose individually paced or cohort-based programs. Individually paced programs are best for students who work well alone; students complete projects and assignments individually and interact through message boards and discussion forums. In cohort-based programs, groups of students complete projects and assignments together, over the duration of the program. Accredited schools are periodically evaluated to ensure adherence to rigorous standards. The two most common forms of accreditation are regional and national. Six regional accreditation agencies serve each U.S. region. All state universities and colleges are regionally accredited. Credits from regionally accredited schools are easily transferable, and degrees from these programs are held in high regard. National accreditation is reserved for technical and vocational schools, and regionally accredited institutions typically do not accept transfer credits from nationally accredited schools. The Accreditation Council for Clinical Research and Education is a specialized accreditation association that evaluates online master's in clinical research programs. The United States Department of Education (ED) oversees all private and public colleges, universities, and distance learning programs. The ED allocates federal funds to students and schools, while ensuring programs adhere to federal guidelines. The Council for Higher Education Accreditation (CHEA) maintains a database of accredited institutions. Visit the ED or CHEA websites for lists of accredited schools. Earning a master's degree in clinical research online prepares students for careers in pharmaceutical, defense, biomedical, and diagnostics industries. Graduates lead clinical trials, testing, product research, and product development that can change the medical industry. Master's students work with the latest technology and up-to-date legal guidelines to prepare them to enter professional roles in the clinical research industry. Sponsors hire CRAs to supervise clinical trials. CRAs work closely with other administrators to monitor progress and ensure the participants are treated ethically. CRAs monitor every aspect of the clinical trial, including the physical site, trial activities, and reports. They work either for sponsors or as independent contractors. CRCs perform clinical trials, following the guidelines of good clinical practice, which are internationally recognized ethical guidelines for clinical trials. CRCs work under the supervision of the principal investigator, processing feasibility questionnaires from sponsors to determine whether the site may administer the clinical trial. Principal investigators oversee clinical trials, working with CRAs to ensure adherence to guidelines. CRCs report to investigators, and they work together to conduct research and write reports. Principal investigators receive grants from universities, agencies, or pharmaceutical companies to administer clinical trials. Clinical research pharmacists oversee the pharmacy operations of a clinical drug trial. They dispense drugs to human subjects, supervise trials, conduct research, write reports, and perform administrative duties. Pharmacists work with CRCs and principal investigators to ensure that good clinical practice guidelines are followed. Pharmacy technicians work at pharmacies, where they dispense medication to clients. During a clinical trial, a pharmacy tech may administer drugs to subjects under the supervision of a clinical research pharmacist. Pharmacy techs receive on-the-job training, but many pursue professional degrees and become licensed pharmacists. Salaries of graduates with an online master's in clinical research vary based on experience, career choice, and geographic location. Clinical researchers work for private and public companies, which impacts salary potential. Researchers who work for universities often apply for grants to fund research, and clinical research coordinators may be independent contractors or may work with sponsors. Entry-level professionals make less than those with at least five years of clinical research experience; experience and skillsets help candidates negotiate higher salaries. The table below shows median salaries for common careers of professionals with a master's of clinical research online degree. Students have several options for financing a master's degree in clinical research online program. Begin by completing the Free Application for Federal Student Aid (FAFSA) to determine which grants, loans, and scholarships you qualify for. Explore private loan options from banking institutions, and consider a work-study program at a university or college that offers tuition assistance. For clinical research students, the American Academy of Neurology offers clinical research fellowships and scholarships.